“in Atlantean land in first of periods as the people began to apply those laws as pertain to the combustion as made for the filling up of the skins that were used for those of transportation, excelled in the USE OF THE ELEVATOR IN BUILDING [WITH]IN THE EARTH.” Page 62. “—when Poseidian land was greater in power, when there was a meeting called for those of many lands to determine means and manners in which there would be control of the animals [Dinosaurs?—GJ] that were destructive to many lands….those who guided the ships that sailed both in the air and under the water, also maker of that which produced the ELEVATORS AND CONNECTING TUBES that were used by compressed air and steam and the metals in their emanations….” Pages 78-79. So it would seem that not only did the Atlanteans use ships and flying machines to migrate around the globe, they used underground tunnels as well. Is it possible that one Atlantean tribe eventually became the Brazilian subterranean people of Tierra Dentro? I say yes! “Hence, these places partook of the earlier portions of that peoples called the Incal; though the Incals were themselves the successors of those of Oz, or Og, in the Peruvian land, and Mu in the southern portions of that now called California and Mexico and southern New Mexico in the United States.” Pages 114-115. “Where was the homeland of these ‘Giants’ and their descendants who perhaps, under particularly favourable external conditions had been able to develop a tall type of men who were quite distinct from the small statured people [local Indians] living in harassed circumstances? Everything points to their having had their original home on the climatically favoured ISLAND CONTINENT BETWEEN EUROPE AND [THE] AMERICA[S], WHICH AFTERWARDS WAS SUBMERGED.” Pages 176-178. “…There presently appeared in the middle of the day, when the sun came out on Lake Titicaca, in the Andes, a white man, OF A GREAT BODY AND VENERABLE PRESENCE, who was so powerful that he lowered the hills, increased the size of the valleys and drew fountains from the rocks [advanced earth excavating technology—GJ] They called him, for his great power,…lord of all created things, and father of the sun…” Page 110. “…Quetzalcoatl had come from a land not [yet] submerged, but one which the ruling class considered so unstable, owing to occasional cataclysms, that they looked out for settlement elsewhere. On this point, it will be recalled that Colonel Fawcett pointed out that all the dead cities of brazil had been overthrown by violent earthquakes…” [Due to Nibiru’s wrath—GJ] Page 99. “…Phaeton [Nibiru] was anciently regarded as a generally round, brilliantly fiery body of appreciable size, and MUCH MORE STAR-LIKE OR SUN-LIKE than conventional comets: and it was held to have in some way caused the Deluge.” Page 212. “…This discovery…was of particular interest if only for the fact that the SUN SYMBOL of the Serra do Machado was perhaps cut into the rock ten thousand years ago. [More like 12,000 years ago—GJ] We were very preoccupied as we climbed down and passed the forbidding emblem of the ‘BEWITCHED SUN’ which guarded the entrance to the sacred burial place…” Pages 55-61. “…When we went back to our tent…and with bated breath I read what the famous member of the Institut de France had to say: ‘Dolmens ornamented with inscriptions and WANDERING SUNS are absolutely specialized objects and are to be found only in Brittany, in Scandinavia and in England with special variations. So I was not mistaken. 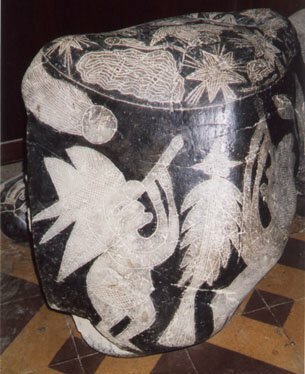 This was ornamented with inscriptions like the Celtic [and] the Peruvian of the Pre-Inca period…I had discovered at one and the same time master examples of analogous dolmens and also ‘wandering suns’ of the Europo-Celtic culture out here on the Amazon…” Pages 38-39. Marcel Homet presents a remarkable connection here stating that the Wandering Sun symbols depicted in the Yucatan and the Amazon regions were also found in Europe! Is the Wandering Sun symbology also shown at Avebury, in England? I believe so. (See ‘Avebury and the Dark Star’ web-page) I find it amazing however that Homet never made the connection that the Wandering Sun would return one day, in which the Hopi Indian tradition foretells. So, according to D. S. Allan and J. B. Delair, Phaeton continued on to become the only remaining wandering sun-like object within our Solar System. At the beginning of this paper I asked the question: Was anything ever written down or engraved on stone documenting a cause for the Atlantean migration? I conclude the answer lies within the ‘Sun Crypt’ discovered by Marcel Homet. This burial crypt houses a stone monument with TWO SUNS etched on it and one of them is Phaeton—the Wayward Sun, the Bewitched Sun or the Wandering Sun known as Nibiru.